Call Our Roofers for Roof Repair Services Today! Because our roofs are an important part of our home, we need to call a professional roofer whenever our roofs are in need or repairs. But when exactly should a roofer be called? Knowing when to have your roof repaired can save you a lot of money and also a lot of stress. Below are times you need to call a roofing contractor for roof repairs services. Whether it be hail damage or wind damage, whenever your home has been inflicted by inclement weather, it’s important to call a roofing contractor. They can determine what type of damage has been done and how bad it is. Are there water leaks on your ceiling or on the interior walls of your home? This is a good indicator that there is a roof leak that needs to be fixed ASAP with roof repair services. There are many things that point to trouble in regards to your roofing shingles. Are they curling? Is there a bunch of shingles missing? Or are the shingles cracked? These require roof repair services by an expert roofer. If the gutters on your roofing system are pulling away, this is not a good sign. 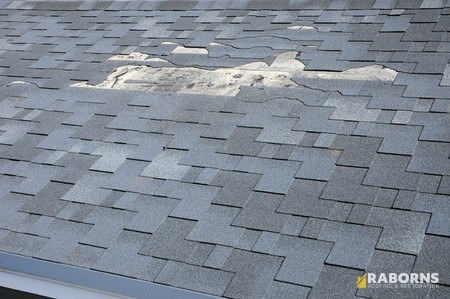 You will need to get roof repairs to address this problem immediately. For roof repair in Georgia, please call the qualified roofers at Raborns Roofing & Restoration by calling (706) 814-3207. We are here for citizens of Georgia when they need high-quality roofing services for their homes. Posted in Uncategorized on November 16, 2017 at 5:50 pm by Raborns Roofing and Restoration.